Those close to the Holy Father expressed surprised delight at the news, welcoming the 'refreshing change', attributing it to the 'God of Surprises' and the persuasive, serene theology of Cardinal Kasper. Cardinal Kasper is said, this year, to be attending the Lewes Bonfire, a traditionally ant-Catholic affair but which in the light of a 'revolutionary Pope' has changed the atmosphere of the event. As part of what has become an annual 'ritual' for the people of Lewes, Cardinal Kasper is reported to be intending to symbolically place into the Lewes Bonfire the Eighth Commandment scribbled on the back of a Harvey's Brewery beer mat, because, in the words of the Cardinal, "Having listened to Pope Francis, I have realised that the Eighth Commandment, for me at least, is obsolete. It gets in the way of my relationship with Jesus, or, at the very least, advancing my agenda." Cardinal Kasper is said to be looking forward to "nearly 2,000 years of Catholic teaching going up in smoke." The Sussex Wicca Society (SWS), who worship both the 'god and goddess of surprises' were "pleasantly surprised", and a spokesman said, "It just shows we are the same now. We worship the same god(dess)." The more mainstream Sussex Satanists (SS) issued a statement, saying, "We are sure there are more important things to do than do than burn effigies of Popes, especially when there is the annual virgin sacrifice is going on the following week in the reformed rite of 1969. Bring sandwiches (vegan only) to share afterwards and if you are a musician bring you instruments for the music group. Any virgins volunteering for liturgy, please sign the sign up sheet in the porch, but equally, do sign up for our bring and buy sale. All tea and coffee will be Fairtrade." More extreme, "less gradualist", but dismissed by mainstream Satanists as 'a passing fashion trend', the Traditional Sussex Satanists Society (TSxSS) said in a statement, "Yes, we too rather like this Pope, he's increased our membership considerably, we are fed up with Pope-bashing now." "We are in a new era under Francis," said the spokesperson. "He is a breath of fresh air. We turn instead look to the burning the effigies of Novus Ordo Satanists like Aleister Crowley, a sickening liberal. Give us back the Old Black Mass (Missal of 1962). In a new era of dialogue, we ask Pope Francis, in the spirit of fraternity and brotherhood, whether he might one day be the one to celebrate it and recognise the validity of our orders. We look forward to ongoing talks with Cardinal Kasper and the Vatican in what we hope will become an historic inter-faith gathering in Rome." Fr Frederico Lombardi, taken aback by the idea said, "This is all news to me, but it has to be said that Pope Francis has made it clear that the chief weapon of the Devil is disunity. Therefore, we cannot rule out unity with even traditional Satanists. Only the Devil could be against such a move." The spokesman for the local Catholic diocese was unavailable to comment, though it is rumoured the Lewes Bonfire Society have been invited to supply a fifty foot-high inflatable Pope Francis intended to fly over the AMEX football stadium in Brighton for the 50th Anniversary Celebrations of the diocese. 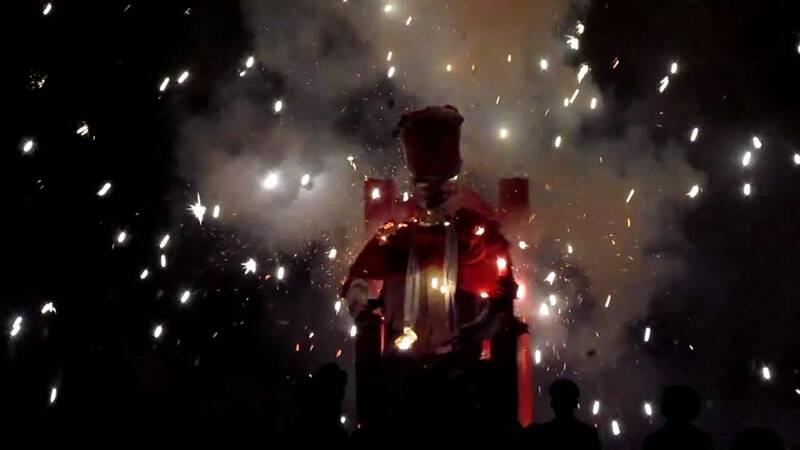 The period of rapprochement between the Catholic Church in England and Wales and the Lewes Pope-burning Bonfire Society is being widely viewed as a "breakthrough" by Cardinal Vincent Nichols after years of "misunderstanding" between the Catholic Church and the Lewes Bonfire Society. Gigantic balloons of Pope Francis which will rise like the phoenix over the triumphant AMEX event taking place in the shadow of the resignation of the Diocese's Bishop due to infidelity to vows and scandalous involvement in the break-up of a marriage of those in his care. However, it is thought, the event should not antagonise locals of any creed or lifestyle, but be a "sign of welcoming" for hundreds of gay couples and divorced and remarried couples for miles, as well as for traditionally more aggressive Protestants in the region. In order to recoup costs, the gigantic balloons may be sold to one of the Lewes Bonfire Societies, or perhaps a Catholic society for burning next year, that is, after the Ordinary Synod on the Family. It is rumoured that, in fact, one or two Cardinals currently 'out of favour' in Rome have already made requests for the balloons. Cardinal Kasper himself welcomed the positive comments by the local wiccans but in a breaking news story, is controversially alleged to have been overheard saying that negative comments by conservative Haitian voodoo practitioners were “taboo” and that they “should not tell us too much what we have to do”. I think you mean the eighth commandment by Catholic numbering: Thou shalt not bear false witness against thy neighbour". The ninth is "Thou shalt not covet thy neighbours's wife." Many people do not know that the protestants re-numbered the commandments at the reformation. I'd like to say that was a deliberate mistake, but I looked them up online and obviously got a Protestant version. Unless you have a recording I deny saying that, and if you do I've got powerful friends and you won't work in this town again. Brilliant, simply brilliant! Funnier than Peter Simple ever was. Not to us, not to us be the glory, O Lord but to Thy name be ascribed all honour and glory. At this significant time don’t forget the Transalpine Occultists, out on their haunting and distant island (the Isle of Wight). Their insistence on making the never-juridically-abrogated 1962 Black Mass – the Vetus DisOrdo – a unifying force for a better liturgy, is now it seems being realised. Fair play to them! !